Home > Media > Alumnae Spotlight > Remembering a "Champion of Smith"
Remembering a "Champion of Smith"
Family, friends and colleagues, including current and former Smith trustees, gathered June 26 in Albuquerque to celebrate the life of Debra Romero ’77, vice chair of the board of trustees, who passed away June 6. Hundreds attended the memorial at the Albuquerque Museum of Art and History, where Romero served until recently as the executive director of the Albuquerque Museum Foundation. Romero was remembered as a Renaissance woman—an attorney, teacher, writer, traveler, artist and cook—and, even more movingly, as a friend, family member, sister and mother. Her laughter and uplifting spirit, as well as her determination and sense of adventure, were recalled by every speaker. The first in her family to go to college, Romero “set the standard” for the value of education for her sisters and extended family, her sons said. After Smith, she earned a law degree at the University of New Mexico and practiced law in her home community. “Debra loved Smith and the Smith community loved her,” Duncan said. Romero served in a number of volunteer leadership positions for the college. Duncan noted the pivotal role she played as chair of the board’s Institutional Advancement Committee during the public phase of the Women for the World campaign. Beyond fundraising, Duncan described Romero as a key adviser who helped the board reach consensus on complex issues. “Debra was a humble but persuasive leader who inspired others to do and be their best,” she said. Romero attended Smith on a full scholarship and remained deeply committed to women’s education and education access. 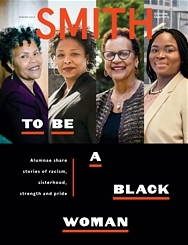 She spoke often to her children about the role of Smith in her life. Shortly before her death, she and her three sons established an endowed scholarship fund at Smith to provide student financial aid in perpetuity. More than 120 classmates, trustees, family members and friends have contributed to the fund in Romero’s memory.